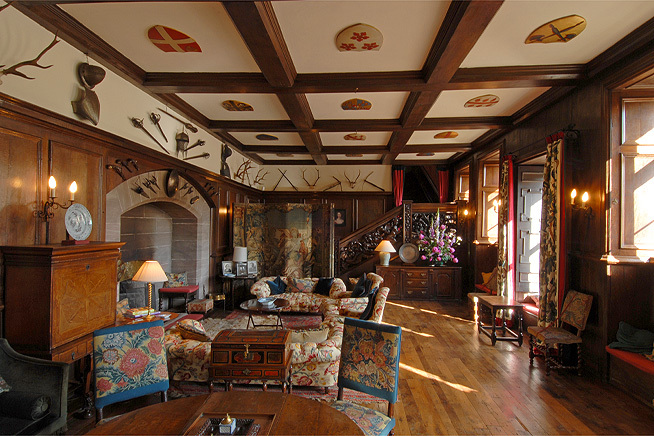 A tour through the interiors at Hutton is a remarkable journey in time. 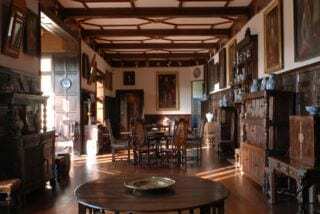 From the medieval Stone Hall to the high Victorian Drawing Room, the rooms are rich in history and notable for their contents. 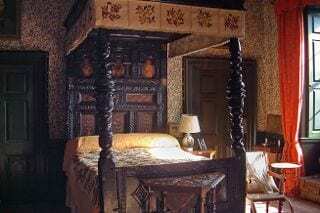 Every room has fine examples of furniture of its period and there is an interesting collection of needlework and tapestry, some of it more than 500 years old. 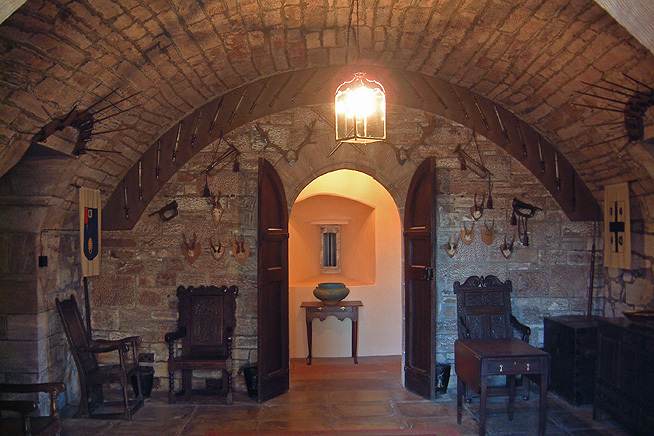 The way into Hutton is through the Stone Hall at the base of the Pele Tower, the oldest part of the building, which was turned into the main entrance in the late 19th century. This barrel-vaulted, dungeon-like room is typical of the period. It has immensely thick walls and contains a display of weaponry. The Hall is one of Hutton’s principal rooms, remodelled by Sir Francis and Lady Diana Olivia Vane with Anthony Salvin in the 1830s. 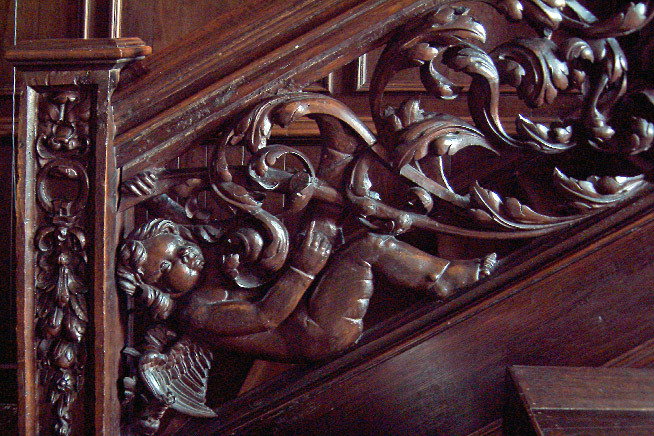 They retained the best of earlier features from the 17th Century, including the panelling and the Cupid Staircase. 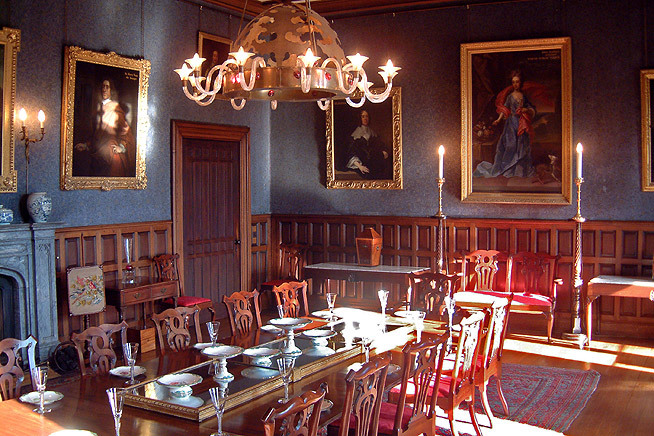 The impact of the room is enhanced by the portraits, the large fireplace, the armour, the antlers and the painted coats of arms on the ceiling. 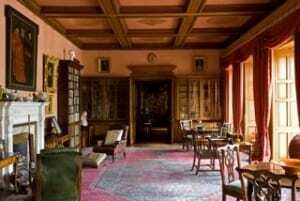 This splendid early 19th Century room in the neo-Gothic style is at the base of the South East Tower. It was designed by Anthony Salvin and provides a fine setting for the grand Vane portraits. The whole room reflects the formality and self-confidence of the age – imposing pictures, a large set of 18th Century dining room chairs and a Gillow table. The ruby cherries of the Bruce-Talbert curtains are picked out in the recently commissioned chandelier. 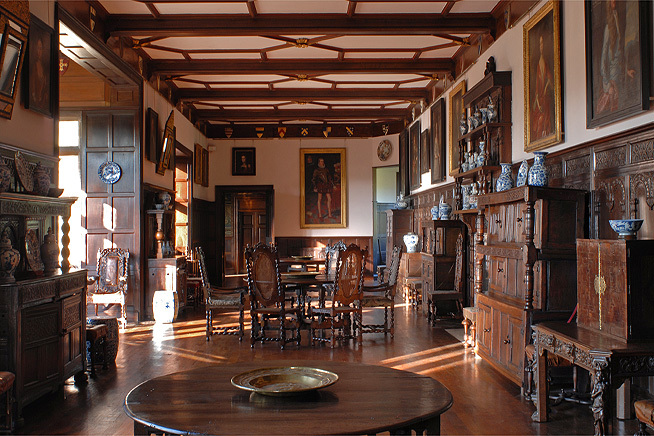 The Gallery shows the influence of some of the great Elizabethan and Jacobean houses of the South of England, where long galleries are a distinctive feature. They are a great rarity in the North, and this one built in 1635 is in the Carolingian style. The oriel window is a delightful feature, as is the north-facing gazebo, looking out over the Walled Garden. The interior was sensitively restored in the 19th Century and has an interesting collection of furniture, family portraits, china and spinning wheels. The Library lies directly behind the late 17th Century classical facade and has a good view towards the Pennines and Cross Fell. It was re-designed by Anthony Salvin in the latter half of the 19th Century, including a new ceiling, oak doors and bookcases. The recent gilding is by Caroline Gibbs. 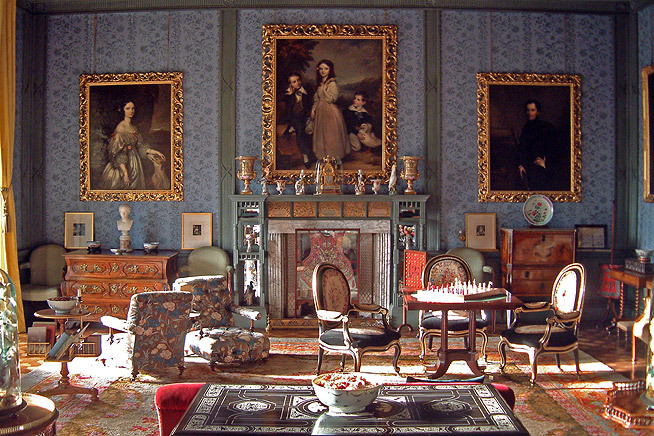 The Drawing Room is a fine example of the richness, intensity, and cluttered diversity of Victorian style in what is essentially a Regency room. It contains an unusual suite of Gillow furniture in the Hepplewhite style characterized by a small rosette at the top of the legs, the side-by-side ‘quarrelsome chairs’ and an early Broadwood piano. This room has a splendid view out across the Low Garden to the Middle Pond. Perhaps the finest room in the house, the Cupid Room is the first of a suite of three rooms designed for Henry Fletcher in the 1740s. This architectural room is named after the Cupid centerpiece of the delicate rococo ceiling, for which the plasterer Joseph Rose the Elder was paid £25 in 1745. 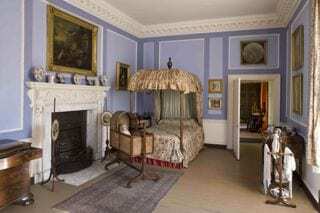 The Blue Room, a bedroom, contains 18th Century furniture, an elegant four poster bed and washstand by Gillow, and watercolours by Lady Diana Beauclerk, whose granddaughter Diana Olivia married Sir Francis Fletcher Vane in 1823. 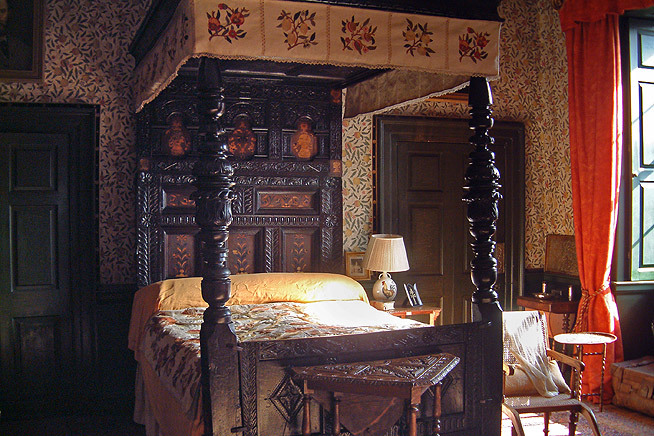 The Victorian chintz bed hangings and curtains are particularly pretty. 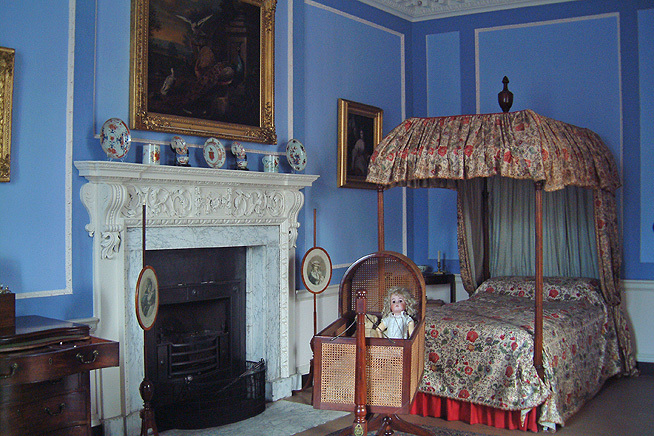 This room is named after Caroline Vane, the second Countess of Darlington, who was a cousin and a regular visitor to Hutton. 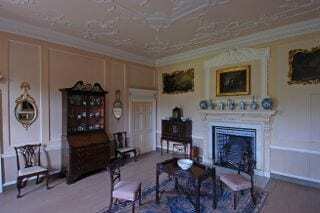 It is an interesting example of an 18th Century room which was redecorated during the Arts and Crafts period. 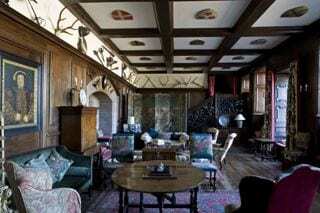 It has dark green paintwork and William Morris wallpaper. 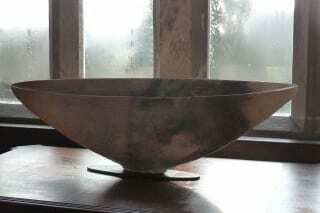 It contains a collection of metalwork from the Keswick School of Industrial Art. Hutton is a romantic place, as the magnificent Cupid Staircase testifies. 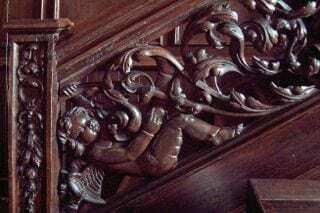 The 17th Century carving of the winged boys swinging on acanthus leaves is unusually bold and vigorous and echoes the panel from the Playing Boys set of Mortlake tapestries at the head of the stairs. 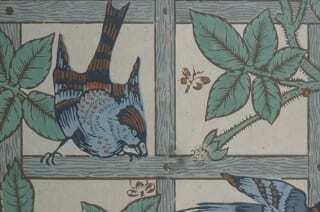 There are still four early William Morris wallpapers in the house. Several more were painted over after the war when they fell out of fashion. The examples found at Hutton are some of the best. 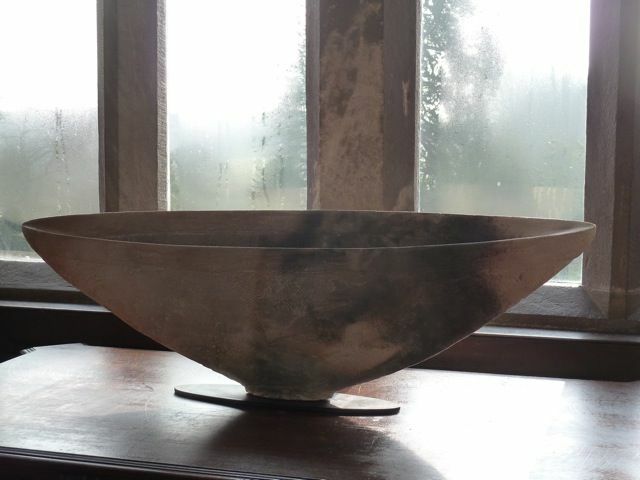 Since hosting Potfest in the Park, an eclectic collection of contemporary ceramics has been built up at Hutton. 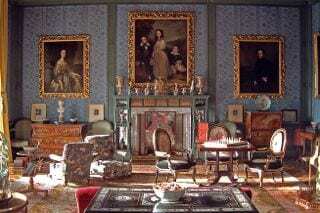 They sit very happily in the old rooms.